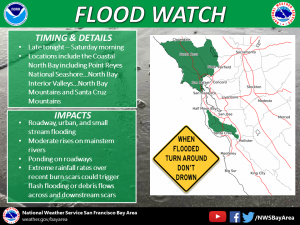 According to the National Weather Service (NWS), San Rafael – along with much of the rest of North Bay – will be impacted by a late-season storm beginning today. Light to moderate rain is expected to begin this afternoon. Rainfall is forecast to pick up in intensity on Friday and gradually taper off by midday Saturday. Please allow extra time for your morning and evening commutes and drive carefully. Overall rainfall totals in San Rafael from Thursday through Saturday are forecast to range from 2.5 to 3.5 inches. Winds are anticipated to be heaviest on Friday (in the 20-30 MPH range) and a flood watch has been issued. There is potential for flooding of small creeks and streams as well as poorly drained urban areas. For downed power lines and power outage reports, call 911 immediately to report the location of a downed line. After reporting the downed line, call PG&E’s 24-hour Residential Customer Service Center at 1-800-743-5000. Consider downed power lines still active. Stay away from the lines and keep others away from them.